Weather can be unpredictable, but how well your home stands up during a storm doesn’t have to be. Any homeowner in areas at risk for damaging storms can benefit from taking measures to increase their home’s resiliency. In fact, many builders in high-wind zone areas are now building to higher standards to help their customers withstand natural disasters. 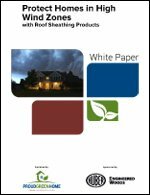 This white paper looks at one such standard, the FORTIFIED Homes program, and how builders are achieving the certification.